As the first prestige biopic in this year’s crop of movie-award hopefuls, Amelia seems paralyzed by both its expectations and the aura of its iconic aviatrix. 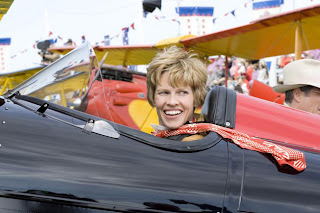 The lushly photographed hagiography of Amelia Earhart – portrayed ably by Hilary Swank – feels like a nostalgic keepsake, dipped in amber and mounted for display. It somehow manages to both lionize and embalm its famous flyer, never managing to stir the emotions of audiences coming to pay their respects. Director Mira Nair uses that tried-and-tired narrative device – the flashback – to tell her tale, oscillating between scenes along Earhart’s doomed 1937 attempt to circumnavigate the globe in her Lockheed Electra and a by-the-numbers overview of her ascent to success and worldwide celebrity, separating the time periods with sun-bathed, cumulus-swirled scene wipes. Save for a single image of young Earhart gazing up at a single-engine plane circling her native Kansas skyline, Nair and the screenplay by Ronald Bass and Anna Hamilton Phelan would have you believe that Earhart’s flying career spontaneously launched the moment she was tapped in 1928 to ride shotgun as the first female to fly (or be flown) across the Atlantic Ocean. Indeed, the overall historical scope of the picture ends up being only the final decade of Earhart’s life. Inspired by the Out of Africa formula, Nair proceeds from benchmark to benchmark, tracking Earhart’s aviation and marketing achievements alongside her romance and eventual marriage to publisher George P. Putnam (Richard Gere, playing Richard Gere). Even less compelling is the PG-rated portrayal of her (purported) dalliance with aviation pioneer Gene Vidal (Ewan McGregor), whose young son Gore is conspicuously foisted onscreen for the apparent and pointless sake of reminding us that Gene was author Gore Vidal’s father. There is minimal chemistry between Swank and Gere, and virtually none between she and the clumsily-used McGregor (a scene in which Earhart and Vidal finally kiss inside a moving elevator, gorgeously shot from just above eye-level, being the lone, notable exception). The climactic 10 minutes of screen time, dedicated to the ill-fated attempt by Earhart and navigator Fred Noonan (Christopher Eccleston) to cross the Pacific and locate their refueling stop on tiny Howland Island, are the most gripping of the film. To her credit, Nair eschews any temptation to take dramatic license with the known facts surrounding Earhart’s final moments. The scene is capped with a singular shot of the dawning awareness of her fate as it slowly crosses Earhart’s face, a better reflection of Swank’s talent and Earhart’s humanity than all the hollow hokum that preceded it. Perhaps Nair wished to make an inspirational movie that could be seen by and appeal to women of all ages. The safe and conventional result, unfortunately, is nothing like the daring, transformative woman at its center. Amelia should have soared. Instead, it simply cruises along on autopilot.